Ever been to a party and got stuck with a large, messy appetizer? You know the ones: you’re trying to finish a sentence but can’t quite stuff all the food in your mouth, globs of food dripping on the floor. That’s why one-bite appetizers are the answer for any party foul. They put both the party guests and hosts at ease. Guests can pop food in their mouths and still converse, and hosts won’t have to clean up messy drippings off the floor. It’s a party win-win situation. We’ve found nine simple and satisfying one-bite appetizers that you’ll want to serve at your next party, and your guests will devour these tasty bites. Rev your taste buds and pull out the party platter! 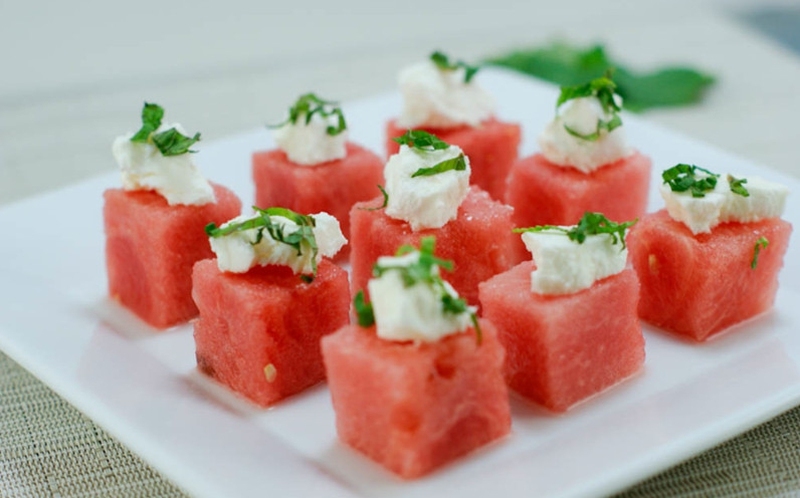 This one-bite watermelon appetizer is so simple…and so scrumptious! Fresh sweet watermelon, salty queso fresco, spicy jalapeno, and a honey-lime drizzle make this one easy one-bite appetizer you’ll crave! See the exclusive recipe here! Skip the messy Buffalo wings and make these handy Buffalo chicken cheese balls. You’ll get classic Buffalo wing taste without sticky, dripping fingers. Jalapeno bites are tasty, convenient little bites that are baked in the oven to crispy perfection. Gooey cream cheese offsets the heat from the jalapeno, so you won’t be able to stop at just one! These twice-baked broccoli and cheese potato bites are incredibly tasty and satisfying. Each of these little bites is stuffed with a delicious combo of broccoli, cheese, tomatoes and potatoes. These easy, quick meatballs are bursting with yummy Asian flavors. Party guests will love these saucy little meatballs! Make the classic brie puff pastry and cracker appetizer into a convenient, portable nibble. This cranberry baked brie puff pastry recipe has done just that. No need to stand around the cracker table with this travel-easy appetizer! Even the Brussel sprout averse will find themselves scarfing down every last one of these delicious bites. Salty prosciutto pairs perfectly with roasted Brussel sprouts for this amazing appetizer. It’s hard to resist these crab and bacon stuffed mushrooms. These filling one-bite appetizers have a taste everyone will love. This crock pot spicy barbecue kielbasa recipe only takes minutes to make and feeds a crowd. Spear with toothpicks and watch them disappear!